Over the last few months, I’ve spent a good bit of my free time (and some of my not-so-free time) learning about hardware and microcontrollers. One product of this will be a series of blog posts I’m working on detailing one of the projects I’ve built using Kinect, .NET Gadgeteer, and a few other odds and ends. I also just started working on my first from-scratch robot with my kids yesterday. So I figured there might be a need for a specific landing point on my site for my hardware-related adventures, and I’ve decided to call it Devhammer’s Garage. The gearbox is a Tamiya double gearbox geared at 114.7:1, and powered by two separate motors. The wheels are from a LEGO Mindstorms NXT set, attached using adapters that Tamiya offers for their hex shafts. 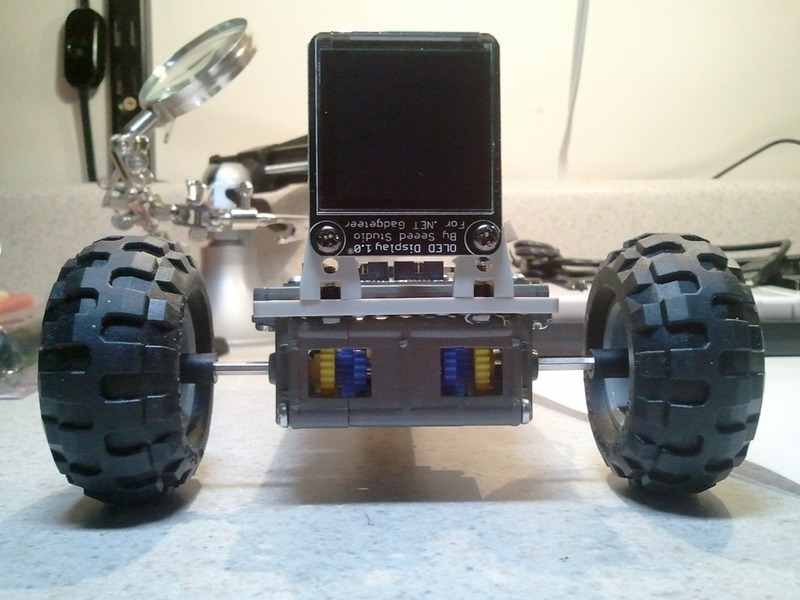 The Hydra mainboard and Seeed Studios OLED Display module are mounted to a Tamiya Universal Plate kit, and not visible in the photo above is a ball caster which will allow the robot to turn easily based on difference in speed between the two front wheels. I’m early in the build process, and I’m kind of designing this first robot as I go along, so I’m still deciding on what kind of sensors to use to help it navigate, etc. The Tamiya parts are very easy to work with. Assembling the gearbox took about 40 minutes or so, in part because I was showing my kids what I was doing as I was doing it, and in part because I took my time to ensure that both sides were geared identically. One advantage of using a gearbox like this is that you can get pretty good torque from even the small DC motors that come with the gearbox, which should help power over any obstacles in the way. I’ll post more pics and videos as the project progresses, and will have more detailed build information over at the Garage.